Freezing morning in Castillonnès market. 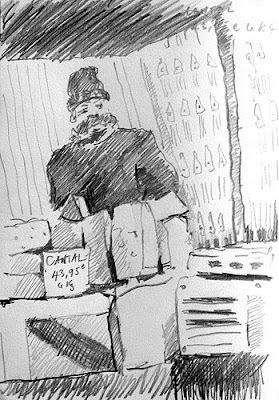 Drew this (cold) seller of honey. The writting says ‘Tarif’. Hand-made products in rural French markets can be pricey. Nobody was buying his honey. When I finished sketching him, I went over to see his honey. He was a ‘producteur’ newly installed in the area, just setting up. He actually turned out to be smiley & friendly. He laughed when I translated ‘Like a Lead Balloon’. I’ve been there too, doing shows when nothing sells…like a lead ballon. Anyway, his sunflower honey was delicious…& reasonably priced. I was thinking that my categories or labels are all up the spout – Sketchbook isn’t a very descriptive label is it? What do you think about ‘streets’? For the people type of scribbles that I like doing… any ideas? ‘Food’ is that any good? Hi, this is to let you know that I have written an article about these cheesemongers that sell such expensive cheese. 49.95€ on this 2008 Christmas Market place Francheville in Périgueux. The same people as the one you drew, as they belong to a kind of franchise. I am looking for as many witness accounts from disgruntled buyers as possible to give some weight to my article as I and many people I know are very upset about those people. No doubt, they give a bad image to market stall holders in Dordogne. They ruin their reputation for many years now. It was time someone did something about it. You can post your comment in English, as I will translate it into French. You can contact me by going to my website and using the contact form. I will then send you my email address. Please add your web address to the comments if you have any. here’s my answer. if you could polish up my terrible french grammer before you publish/forward, i would be grateful. do hope you understand it! I write in haste. please send back your corrected version to me & i’ll blog it aloing with next ‘croquis du marché’, along with lik & acreditation to you. hope you understand what I’m saying about not wanting to police the markets for this ‘arnaque’. blogging de proximité a bon avenir, à mon avis. SEO services is what you need to propose along with web design. Cantal est un de mes fromages français préférés. J’ai fait un pèlerinage au marché des fromages à Aurillac. Que c’était beau! Que saveurs! Quel ronds! Que producteurs avec quel talent! La vache…c’est le moins que on puisse dire. Donc je suis assai gourmand de connaître que le cantal ne viens pas de la Dordogne et que un bon fromage n’as pas de moisissure verte au milieu de son coeur. Toute le monde a besoin de gagner le sous. Pour mon part, je n’aime pas le pauvreté ni exclusion. J’ai connais le deux, hélas. Je n’aimerais pas que quelqu’un soit exclus. J’aimerais de croire que les forces de marché libre vont périmer son entreprise (comme déjà son fromage) car toute simplement c’est trop cher ( trois fois le prix du supermarché!) et personne aime d’être traité comme un pigeon (‘sucker’ en anglais). Quel niveau du prix doit un revendeur propose avant qu’il est déclaré ‘criminel’? Et qui va faire le jugement? Toi? La ville? Les gendarmes ont les tracasses beaucoup plus important a faire. Non merci donc à son exclusion. Ce marchand est un revendeur. Entre revendeur et producteur, viola la vrai debate. Si il y a un besoin un peu de réglementation, à mon avis, c’est ici qu’un intervention peut être faite. Portant, qui ne sait pas que Cantal n’ai pas fabriqué en Dordogne? (Pas mal des étrangers). Ce n’est pas loin du principe que la Champagne A.O.C. a gagné avec le droite de marque du nom ‘Champagne’. J’ai toujours aimé ces petits étiquettes, souvent en tablette et craie, qui indique le lieu-dit du producteur. Fièrement. Le marché de Bergerac fait ceci très bien. J’aime les villes qui promouvoir les marchés des producteurs. Quelle plaisir de rencontre les producteurs du pays. Quelle talent, quelle gentillesse & quelle passion pour leur produits/créations. 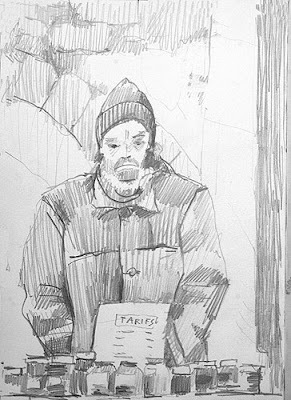 Dans les marchés d’hiver, j’ai entendre le douceur du pays, les rencontres et les conversations entre vendeur et acheteur. C’est vraiment un grand trésor de ‘La Civilisation Paysanne’. Et en été, quoi de meilleur de déguster en soirée marché-gourmande, peut-être en plein-air chez un producteur. Dans mes expositions, j’accueille souvent les touristes. Je suis un producteur des tableaux. 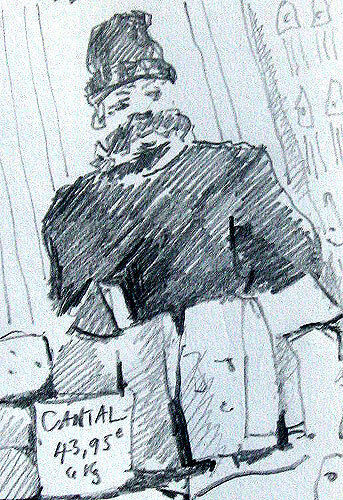 Créateur. Producteur. Les gens aiment de rencontre les producteurs. Mes petits croquis du marché ont ceux-ci comme thème : produit et son producteur. Petit hommage de mon part. This is an update on the issue of expensive cheeses being sold on French markets and notably in Sarlat and Périgueux. I was interviewed on French regional TV about this subject and, since a French report on France 2 with hidden cameras, those market people have been banned from Périgueux and Brantôme market. I think Angoulême has also banned them. But be careful, because there is still one of then on the place Saint Silain in Périgueux who managed to remain there. You recognise theses salesmen or saleswomen because the price of their cheese is well over 30€ a kg and they only sell hard cheese (heavier you see, so you always get to pay 20€ or more (70€ in the case of my ex-wife uncle)). As we say, ‘hard cheese’ (ie tough luck) to the scam artists abusing the market places,the whole image of ‘produits de terrior’& poor old cantal. BTW, I was in Figeac market last weekend & bought & delicious fresh, fragnta & beautiful cantal … at 9,50 euros! No problem about’ hi-jacking’ thanks for keeping me informed. Does Elonora GROSJEAN know about this scam?